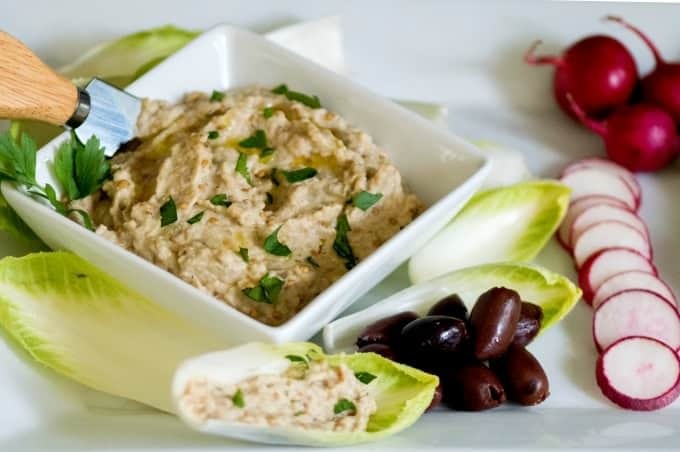 This Baba Ganoush Recipe is a delicious way to use the abundance of eggplant found in gardens, Farmer’s Markets, and stores this time of year. It’s also a wonderful way to get your family to eat their vegetables without complaint. I have to admit, I’m not ordinarily a fan of eggplant. That’s why I add plenty of sauce when serving it in Garden Ratatouille with Fresh Basil Cream. On its own, eggplant is often mushy and, unless cooked properly, can taste quite bitter. In this Baba Ganoush Recipe, it takes on an entirely different taste: smoky, creamy, and with a surprising depth of flavor. Whether you start by roasting the eggplant on the grill or in the oven, this is one recipe that can completely change your mind about eggplant. This Levantine dish draws its name from the Arabic words for spoiled father. According to the Oxford English Dictionary, the dish was created by a member of the royal harem. The implication, of course, is that it was prepared to please a pampered sultan. If you have picky eaters who seem to think they’re royalty, chances are they’ll love this Baba Ganoush recipe, too. Just about every country in the Levantine area has a variation of this dish. In Israel, it’s made without tahini and called Chatzilim. In Syria, it’s called Moutabbal. Even where it’s called Baba Ganoush it’s often spelled Baba Ghanoush or Baba Ganouj. 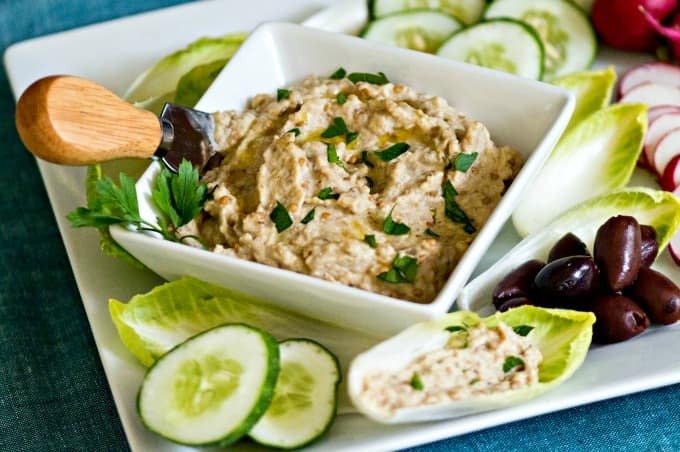 And, in the United States, it’s often referred to as “Eggplant Caviar,” though typically without tahini and usually with other vegetables, like tomatoes and onions, included. Whatever you want to call it, it’s good, and it’s easy to make. On the grill: Traditionally, Baba Ganoush begins by roasting an eggplant on a spit over an open fire. Not many of us keep open fires going in our kitchens or backyards, though. These days, it’s grilled by putting the whole eggplant on a grate over medium-high coals for 30 minutes, turning it occasionally until the skin is charred all over and the eggplant is soft. Gas burner: Skewer the eggplant with a large fork and use a flame-proof oven mitt if you want to char it by hand directly over a gas stove burner. Be sure to open your kitchen windows first to keep your smoke detector from shrieking. In the oven: Preheat the oven to 450°/ 230° C / gas mark 8. Pierce the eggplant all over with a fork to allow steam to escape. (You don’t want an eggplant explosion. Trust me.) Put the eggplant in a pan and roast it for 20 to 30 minutes, no turning required, until the eggplant has softened and the skin is wrinkled all over. Want to get truly authentic? Make some Homemade Pita Bread, toast or grill it, then tear it into strips. Or turn it into Homemade Pita Chips for added crunch. For a lighter appetizer, serve it with your favorite fresh vegetables. It’s delicious with cucumber slices or radish rounds. Piped into endive leaves, it’s an elegant finger food. 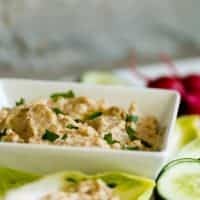 To make it more familiar for kids, use carrot sticks and celery strips – they won’t even know they’re getting extra veggies thanks to the Baba Ganoush Recipe they’re scooping up. 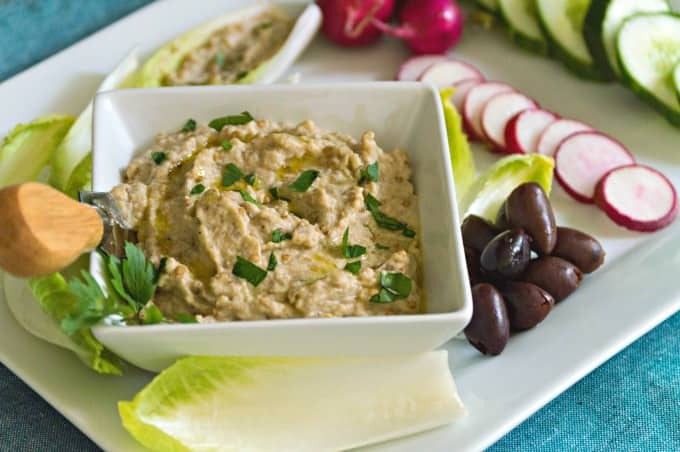 This smoky, creamy eggplant dip traces its origins to the Levantine area where it goes by many names and spellings. 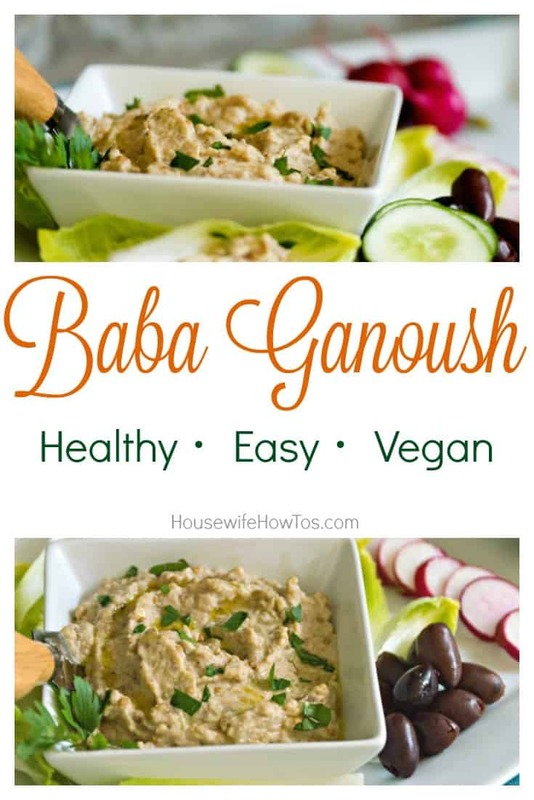 One thing we can all agree on: it's fun to say "Baba Ganoush!" To grill: Preheat the grill to medium-high heat. Place the eggplants on a grate directly over heat and cook, turning occasionally with tongs, until they're softened and the skins are charred all over (approximately 30 minutes). Transfer to a bowl and cover with plastic wrap for 10 minutes. Over gas burner: Impale the eggplant on a fork or skewer and hold it 3-5 inches over a medium flame, turning frequently. Continue cooking until the skin is charred all over and the eggplant is beginning to soften (approximately 15 minutes). Transfer to a bowl and cover with plastic wrap for 10 minutes. In the oven: Preheat the oven to 450F / 230C /gas mark 8. Prick the eggplant all over with a fork so steam can escape. Place the eggplant in a pan or oven-proof skillet and roast it until the skin is wrinkled all over and the eggplant is soft (around 30 minutes). Transfer to a bowl and cover with plastic wrap for 10 minutes. Once the eggplants have cooled, remove their skins with your fingers and transfer the rest to the bowl of a food processor. Add the garlic and tahini and pulse for 10-20 seconds leaving the ingredients still chunky but combined. Add the lemon juice, olive oil, smoky paprika, and parsley to the food processor. Pulse again a few times until it's reached your desired consistency. Taste and add salt as desired. Transfer to a serving bowl and drizzle with additional olive oil, garnish with parsley leaves and serve. Like this recipe? Please Pin it!